This is the largest model kit in our product line to date! 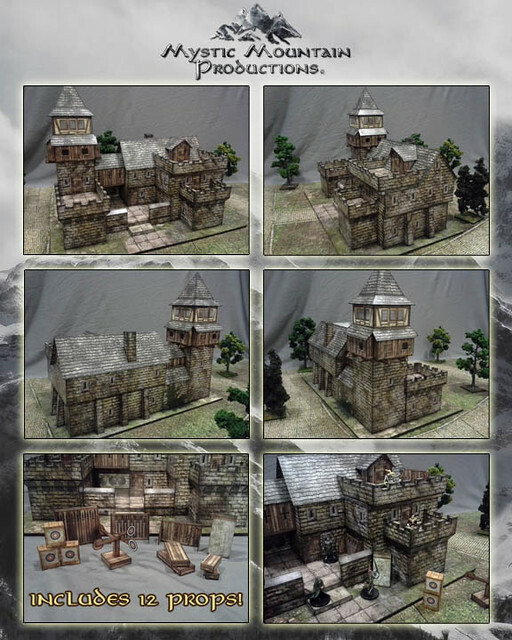 The Barracks is a play set that features 3 battlements, a courtyard and base for miniature encounters. It also includes a watch tower for added ranged support. In addition, the kit comes with 12 unique props to a barracks setting, including some that have never been seen before! Not enough props? How about a bonus PDF of extra props from the kit to ensure your Barracks is fully stocked. Bring your games to a whole new level with this defensive play set! Inside the Detailed Instructions Guide you will find unique role playing details to help bring this model to life in your games. There’s enough information for Game Masters to tailor the model setting to their needs. The model is scaled at the standard 28mm for tabletop gaming; however a scalable printing chart is available in the Detailed Instructions Guide. This is a single-layered model for ease of printing and is compatible with Adobe Acrobat Reader 7.0 or later. A hidden Easter Egg unique to Mystic Mountain is hidden somewhere on the model. Can you find it? 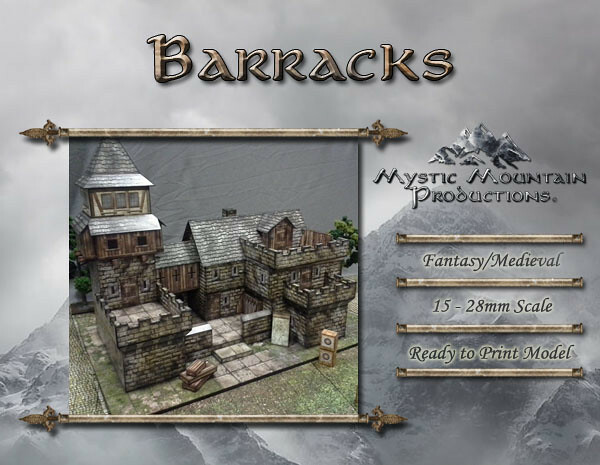 I am a fan of Mystic Mountain Productions' 3d models: They creat rpg game structures of the same high quality as Dave Graffam Games and this Barracks model is no exception. Assembling the model was a pleasure, mostly because of the most-excellent instructions they provide, and the finished project is quite impressive looking. Although I am not in position to use the Barracks in the current ongoing game I participate in, I made sure the GM was aware of its existence, to which he expressed a strong interest for use in some future get-together. The model presents some potential battle ideas due to its design, so I'm looking forward to having it in one of our planned sessions. The Barracks is an extremely sturdy model (if you build it according to MMP's suggestions), and even though it's not easy to transport, the beauty of the model over-rides any negatives. You will not be disappointed with any of their models and especially this one. Of note, however: In the copy that I purchased there were unneeded duplicates...See more of pages 24 & 25 on the following pages. I mention that only so you will know to stop printing after the 25th page. But this error has most likely been fixed by now. I am keeping close watch for all of Mystic Mountain 3d model releases because I do not want to miss even one!